Love is the true nature of the Divine Unfolding of Being. It is that Unfolding of Being which is “I Am.” You are that as well. Our love for each other is who we are when we are not scared and confused and cut off and shut down. This is the message that I hope you will take away from our exploration. 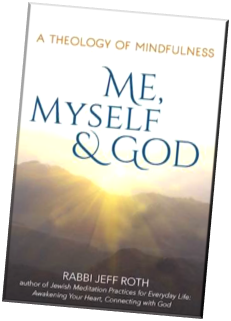 The Awakened Heart Project is happy to offer copies of Rabbi Jeff Roth's newly released book, "Me, Myself and God," on a donation basis. The cost to us is $12.00 per book. We ask for a donation to help cover that cost. If that amount is a burden to you, please donate what you can. Any amount above our cost will enable us to offer the book for less. Many of our human existential struggles stem from the sense of disconnection, alienation and loneliness that comes from a fragmented view of reality. The typical concept of “self” creates a sense of isolation from other beings, leaving us feeling lost and hopeless. But the practice of mindfulness, combined with the teachings of Torah, offer a direct path to liberate ourselves from alienation, awaken to the truth of the present moment and create a new relationship with God. Rabbi Jeff Roth is the founder and Director of The Awakened Heart Project for Contemplative Judaism. He is the co-leader of the Jewish Mindfulness Teacher Training program. He has also facilitated over 190 Jewish meditation retreats.